Brussels Airport, also known as Luchthaven Brussel-Zaventem or Aéroport Bruxelles-National, is the most important and largest airport in Belgium. The airport is one of the 20 largest airports in Europe with a total of 17 million checked in passengers a year. 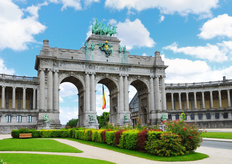 Brussels airport is served by scheduled and charter airlines offering cheap flights from many destinations in Europe and worldwide. From Brussels orbital motorway R0 onto the A201 which leads to the airport. The airport is then signposted. Yes; paid parking, about 12500 short and long term spaces.